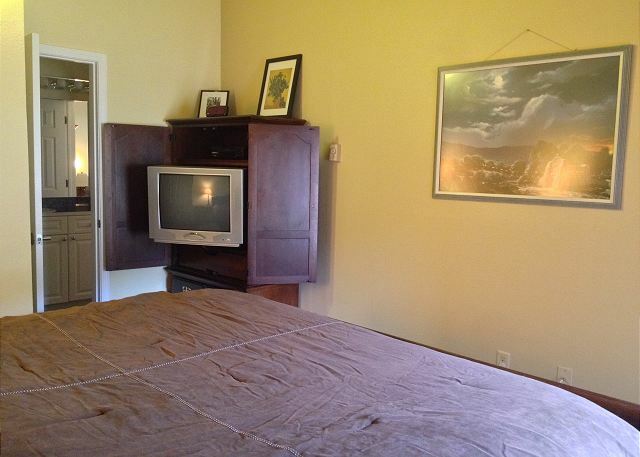 Escape to the bedroom w/ soon-to-be flatscreen TV. 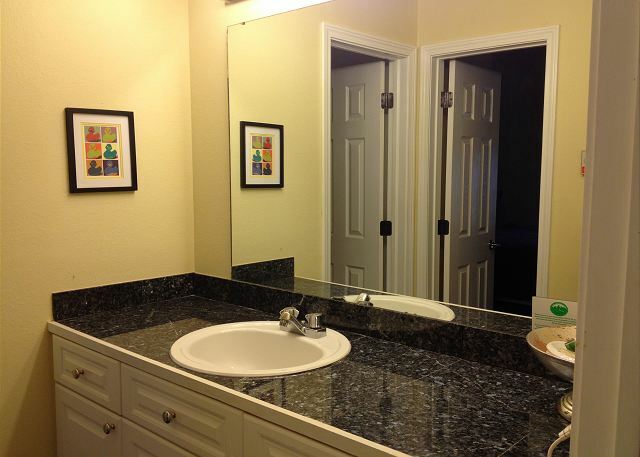 Upstairs bathroom remodeled w/ granite counters, new paint & cabinets. So many games, puzzles and toys we can't count 'em! Puzzles and games and toys........oh my! 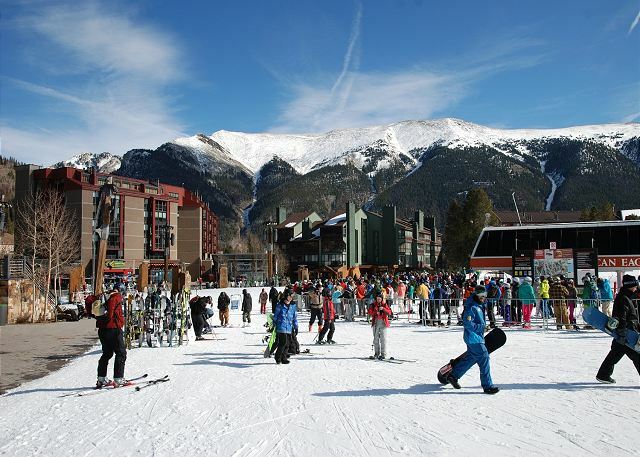 Copper's bustling main village and American Eagle lift. 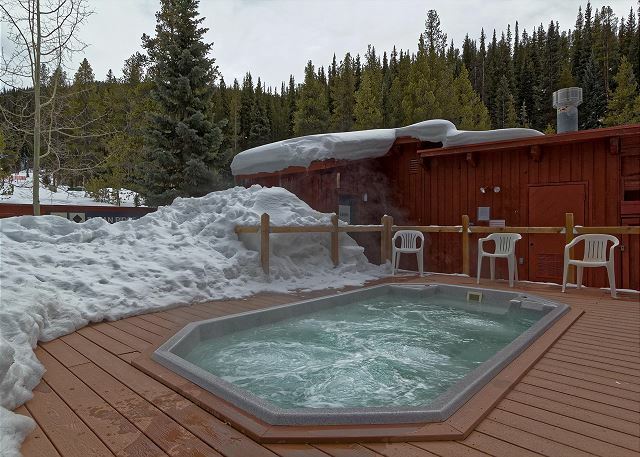 Just outside, soak away your cares in the large outdoor hot tub. Your group will love hanging out here on those blue sky sunny days. Store your gear in your own assigned locker. We love the gorgeous redwood style of Timber Creek. Your unit is in the top right corner. Lots of windows and views! 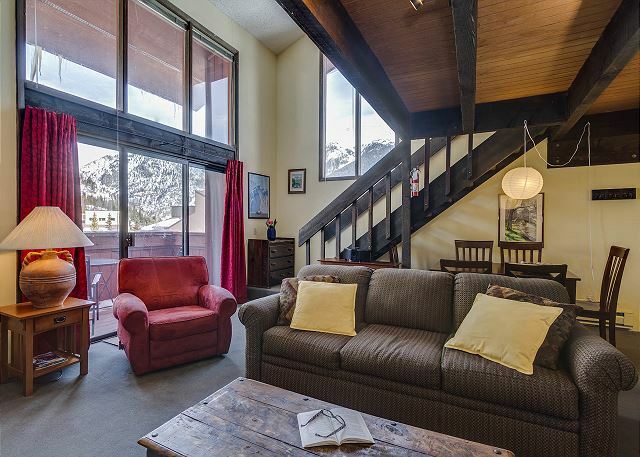 If you're a family in need of an active mountain getaway or quality bonding time, you've found your perfect vacation home base. 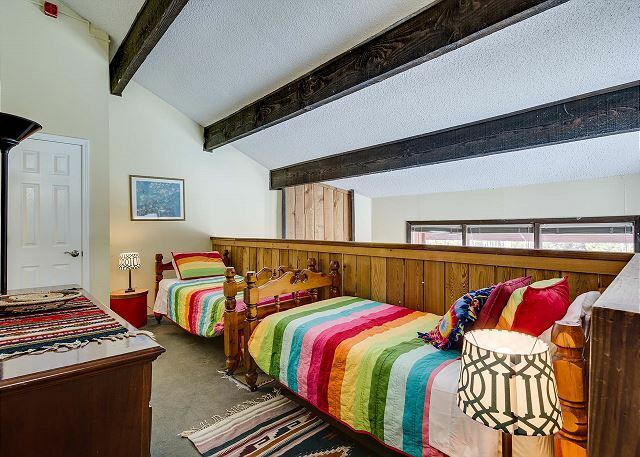 To make your family feel at home, the owners thoughtfully supplied this condo with many fun extras including a child booster seat, pack-n-play, lots of DVD's, loads of fun board games and toys, childrens' art supplies and books. Don't worry - if you're a couple wanting a romantic getaway or a group of friends, you won't even notice all the kid stuff. It's neatly tucked away in closets and drawers. And there are books, movies and games for adults too! 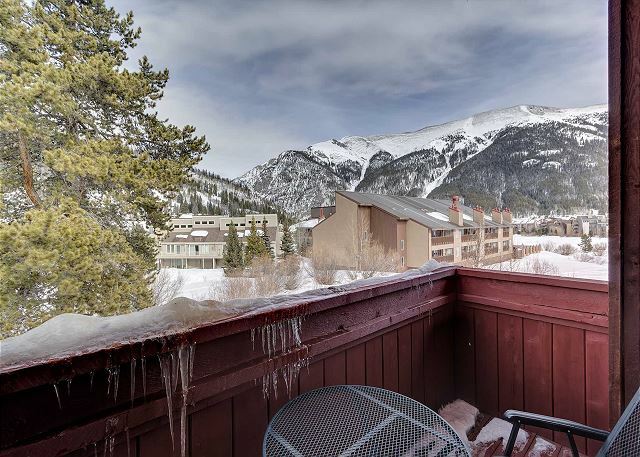 At the end of an exhilarating day on the slopes, you'll ski into Timber Creek, leave your skis in your own assigned ski closet and then kick your feet up in front of the warm fireplace in the condo, or soak your tired muscles in the huge hot tub outside. If you don't ski or snowboard, there's plenty to do. 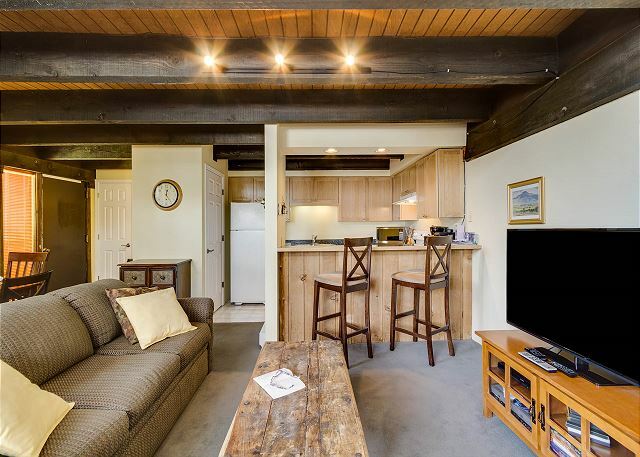 You can relax by the fire and enjoy a book from the condo collection, watch a movie on one of the two flat screen TVs, listen to your favorite music in the iPod docking station or cook an amazing meal for the troops. And don't forget that you're less than a 5-minute walk from the Center Village restaurants, shops and entertainment. 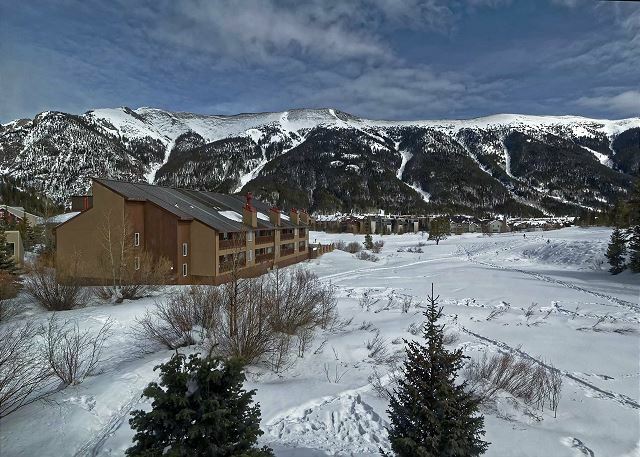 Timber Creek is a gem, with ski-in, walk-out slope access, conveniently located in the Center Village, just steps from the beginner Gem and Pitchfork lifts. If you're not a beginner, you'll take the Gem lift up to access the Super Bee lift and more difficult terrain on the east side of the mountain. Or take a short walk to get to the main Center Village lifts. This condo is peaceful and quiet despite its convenient location - just far enough away from the busy and noisy main plaza. 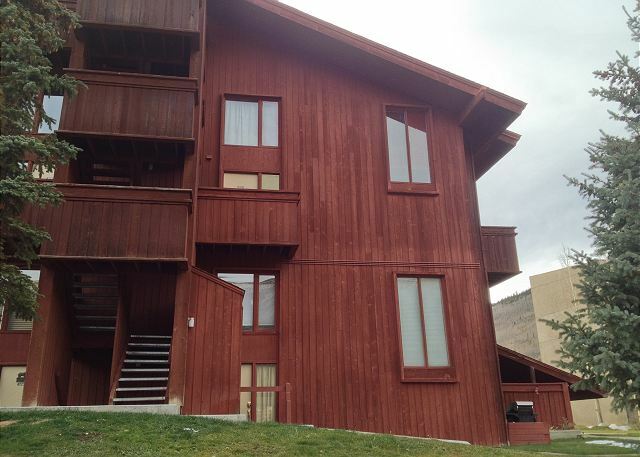 You'll be on the 2nd floor, so you won't have any loud ski boots stomping above you. Your views are the "Sky Chutes" to the east and the Gore Range mountains to the north. 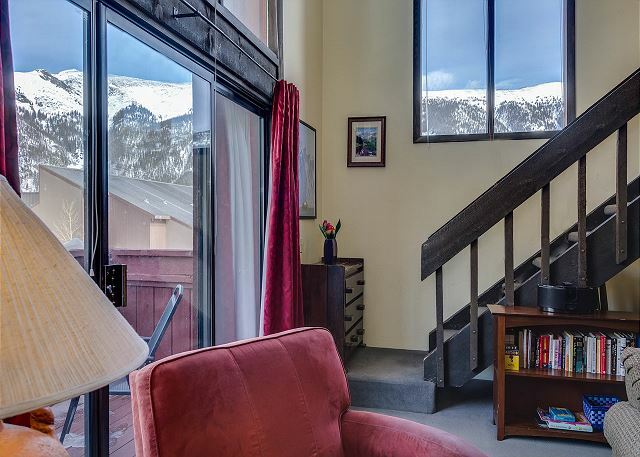 There's nothing like sitting on your own private balcony, enjoying a local microbrew or soothing hot chocolate while taking in the glorious mountain views! 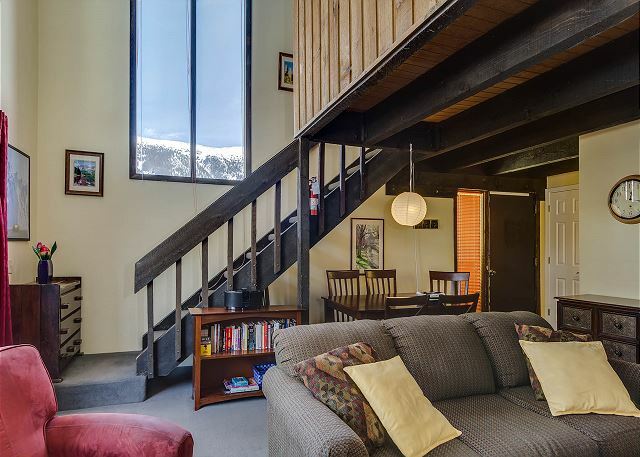 Sleeping arrangements for 6 people include a king bed in the bedroom upstairs, 2 twin beds in the loft upstairs, and a queen sofa-bed in the living room on the main level. You will LOVE having 2 full bathrooms - one upstairs and one on the main level. 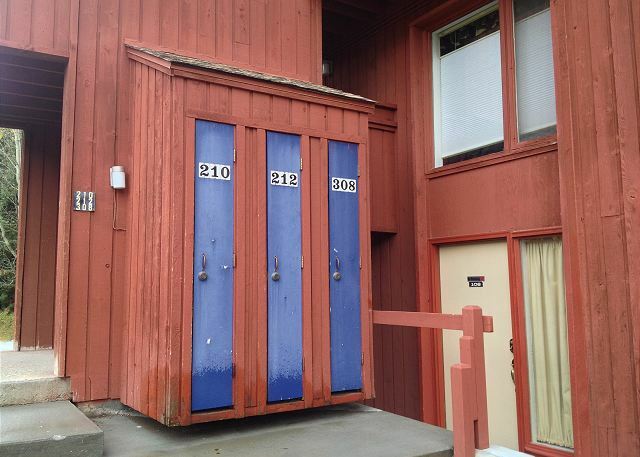 You won't find many one-bedroom condos with even 1.5 bathrooms, let alone 2 full bathrooms! 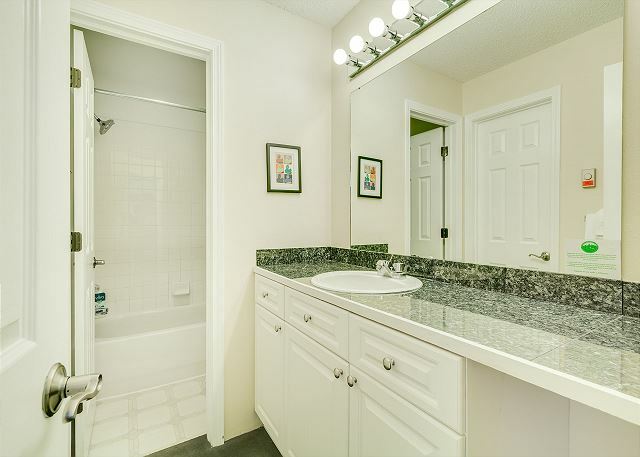 And both bathrooms feature a vanity/sink conveniently separate from the tub and shower. 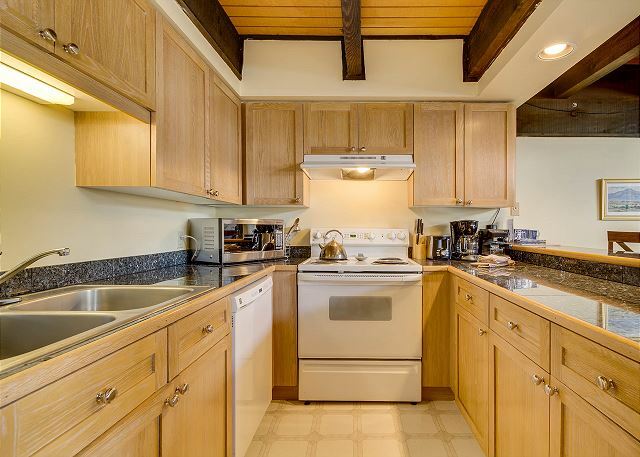 Your group's chef will prepare your favorite feasts in the recently remodeled fully equipped kitchen with sleek granite counters, new cabinets and some new appliances. Everything you need...except for food, of course! 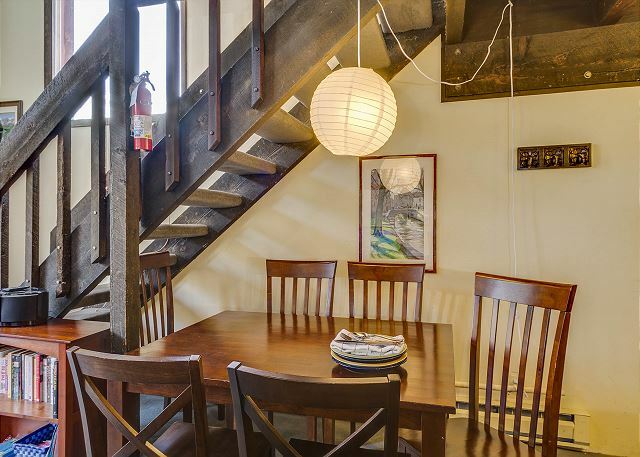 You'll gather at the dining table for 4-6, or grab a quick snack at the bar that seats 2. 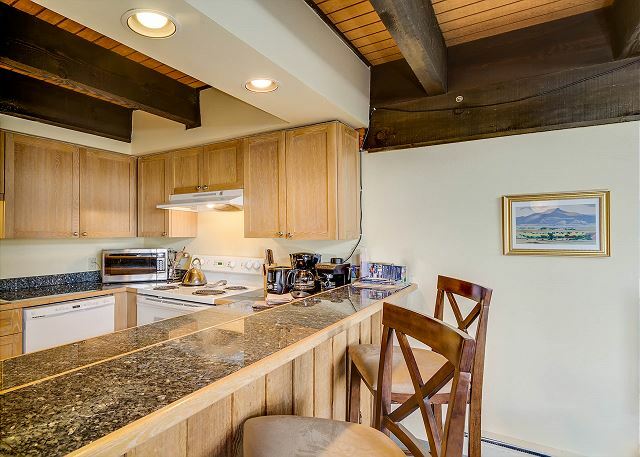 The open layout of the kitchen and living room ensure that everyone is included in the storytelling at the end of an exhilarating day on the mountain. 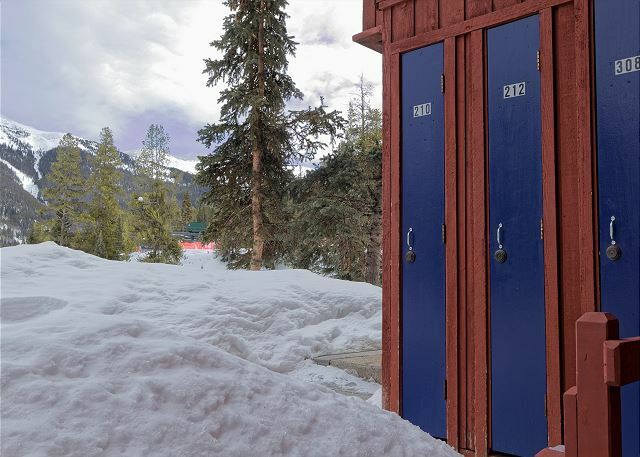 Additional on-site amenities include a covered parking spot, ski locker, laundry room and a slopeside sauna and hot tub...complete with mountain view and stars. Fresh Pow and Green Nugs! Spoice! 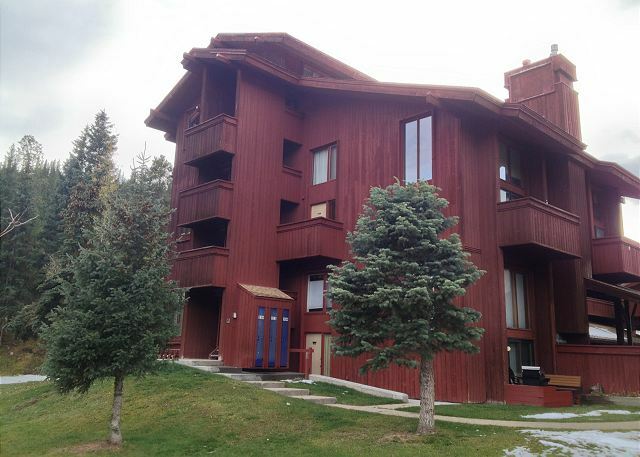 My family of 4 (kids ages 9 & 10) just stayed at this condo over the weekend. It was just perfect for us! 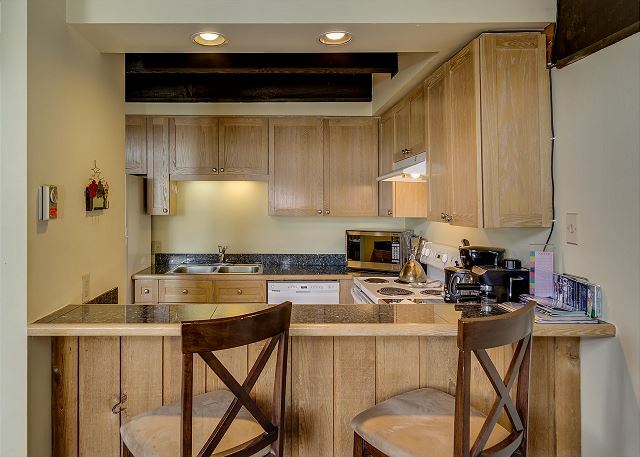 Plenty of room for all of us & even a nice sized kitchen. The kids loved their special little loft area and appreciated all the books and games. Access to the slopes was just a short walk and at the end of the day we could ski almost right up to the ski locker! It's perfect place for a family. We highly recommend it! Great location. Clean. Beds were comfortable and the place had everything we needed. Great price! Nice having ski locker to use. We had a wonderful time in this condo. Everything was as advertised and actually a bit better. The condo was very clean and well supplied with lots of shampoo, soaps, tissues, TP, kitchen supplies and utensils. More than we've ever had in a vacation rental!! And we've stayed in lots of vacation rental condos over the years. We were able to ski right into the building....literally. I got a bit out of control and actually "bumped" the building on the way in. Shhhh. We relaxed by the lovely fireplace at night and the kids played games and watched movies. 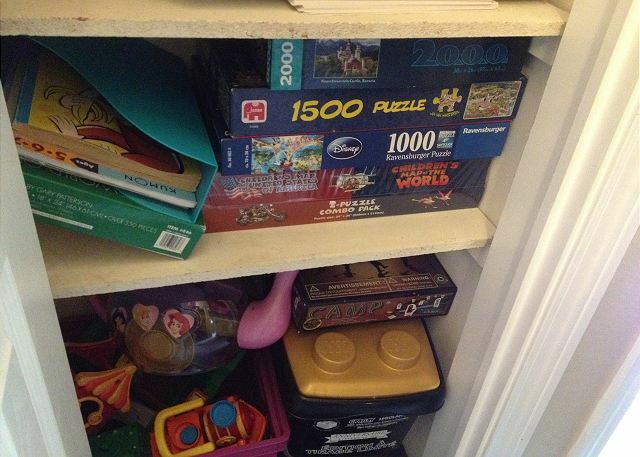 There is quite a variety of games, puzzles, movies in this condo. I would highly recommend this property to my friends and family except for the ones who have mobility issues because there's no elevator. 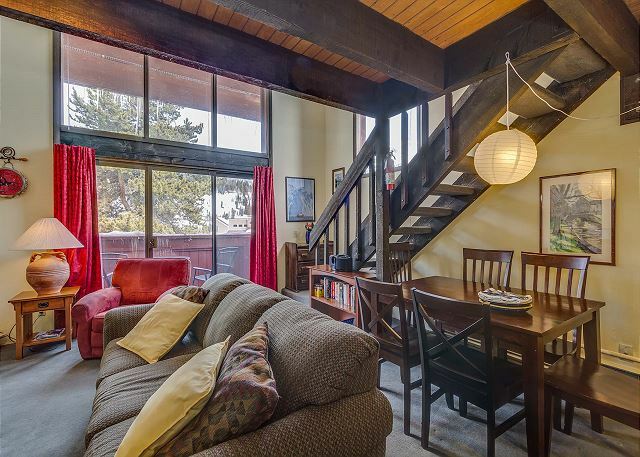 This condo is just on the 2nd floor though. Leigh, the manager, and the management staff were all exceptionally helpful, professional and friendly from the time before we booked, to promptly responding to our questions, and all the way to our departure day followup. The condo was perfect for the 6 of us staying there. Great location for the price! Easily ski-in from the base of Center Village, but you'd need to walk the 300-400 yards to Center Village to get quick access to the main lifts which wasn't a problem. You can also take the really small bunny slope lifts behind the condo to Super Bee but that takes a bit more time and the cat walk between Gem and Super Bee is very flat so if there is powder on the trail your toast until it gets packed down. 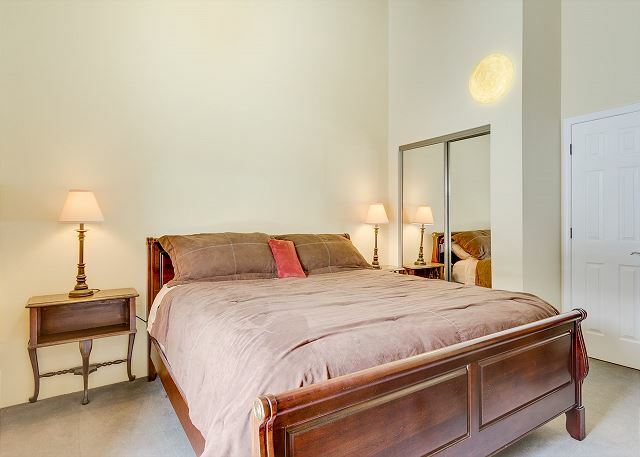 Overall, a great condo with all the amenities at a great price, would definitely stay here again!